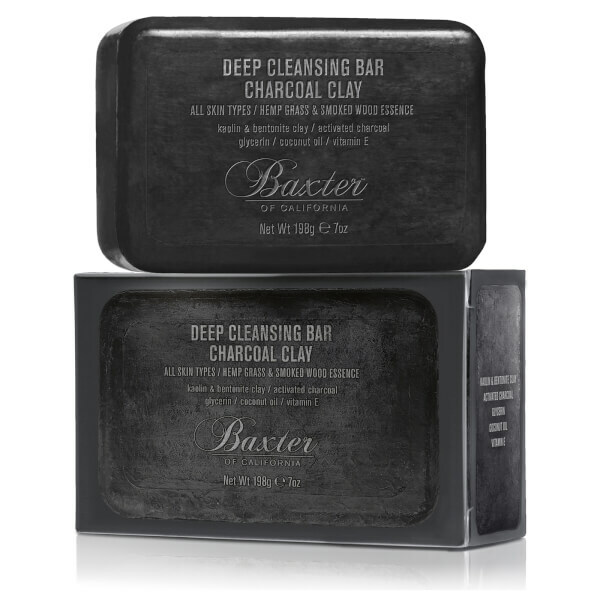 Revitalise your face, beard and body with the Deep Cleansing Bar Charcoal Clay from Baxter of California. Combining Activated Charcoal with detoxifying Kaolin and Bentonite Clay, the 3-in-1 formula creates a foaming lather that effectively eliminates dirt and impurities, without over-drying. Glycerin and Coconut Oil deliver long-lasting moisture and hydration to leave skin feeling soft, smooth and comfortable around the clock. 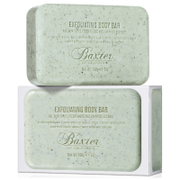 Imparts a masculine fragrance of smoked wood and hemp grass. Sodium Palmate, Sodium Palm Kernelate, Aqua / Water, Glycerin, Parfum / Fragrance, Sodium Gluconate, Maris Limus Extract / Sea Silt Extract, Cocos Nucifera Oil / Coconut Oil, Charcoal Powder, Palm Acid, Sodium Chloride, Bentonite, Palm Kernel Acid, Ricinus Communis Seed Oil / Castor Seed Oil, Kaolin, Tocopheryl Acetate, Salvia Sclarea Oil / Clary Oil. (F.I.L. D221397/1).